Despite having the shadiest launch this side of the Phantom console, Psystar actually managed to ship units out to users. Salud! However, there are still a number of problems with Psystar's implementation that makes us have to recommend to our readers not to buy it. Maybe when they get their act together (and probably not even then), but definitely not now. Here's what we think. 1) You can't update. System update is disabled, so you're stuck with the version of Leopard that came with the system for all eternity. What with Apple issuing bug fixes, security fixes, and new versions of their software, this is a bad, bad situation. Hell, even Hackintosh systems you build yourself let you update, even if you have to be picky about it. 2) You can't reinstall Leopard by yourself. If your hard drive borks out or you somehow screw up your installation, you're out of luck. And by luck, we mean $50 plus shipping. You have to mail your drive back to Psystar in order for them to reinstall the OS for you. 3) Their support is untested. When people buy a pre-made machine, they're paying a premium for tech support and warranty support. It's still unclear how good Psystar's warranty support is, but if the $50 fee for reinstalling your OS is any indication, they're going to nickel and dime you whenever you have more than minor problems. 4) Psystar might be going out of business soon thanks to Apple. Apple's been silent about the issue, but there's no way they're going to sit still while someone sells a hacked version of Leopard on vanilla hardware. It could very well be possible that Psystar will win the fight and continue to sell machines, but would you buy a Dell right now if Microsoft was possibly threatening their entire business model because they were selling unauthorized versions of Vista? 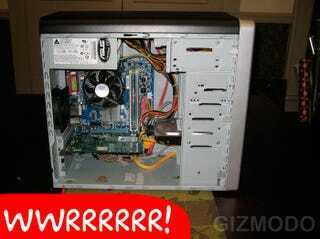 5) The hardware build quality isn't great, and the fan is incredibly loud. These machines are made from off-the-shelf parts, which is fine, but it's not going to be top quality construction for the price they're charging. If that's not enough to dissuade you, the fan is incredibly loud because it's always running at full blast and there's no control interface to turn it down. 6) You're not only buying software that breaks Apple's licensing agreements, but the license of the software used to patch Leopard. I don't personally have a huge problem with this, but some people might have an ethical objection. 7) You can build a better one yourself fairly easily. By following Lifehacker's guide to building your own Hackintosh, you can grab your own OS X machine with a trip to Fry's and a couple hours of downloading/installing. Yours will even update correctly.